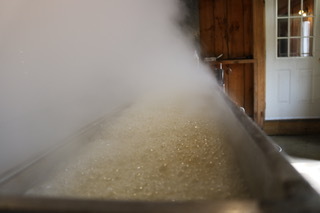 Our Pure Vermont Maple Syrup is made right here on the premises from our own sugar maples. 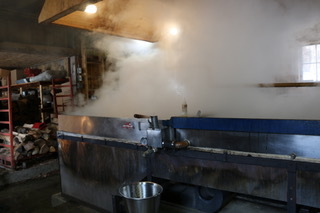 During sugaring season, which could include parts of Feb, March and the beginning of April depending on the year, we invite you into our sugarhouse for an up close and personal tour. The sugarhouse is connected to our farm store which is open year round. We have many items for purchase which include our own Vermont maple syrup, our famous apple cider donuts, muffins, scones, pies and pastries and much more are made year round in our on-site commercial kitchen. We make our own jam, made with fruits from our farm or local orchards. We carry local made raw honey, fresh made 100% pure maple candy, maple cream, and many other maple and local products. Order our 8 Pint Special! 8 Individual Pints of Delicious Maple Syrup shipped in USPS Large Flat Rate Box. For more products, visit our shop page.